She is the beauty of time which is as old as creation. She has values you can't put a price on! She holds the torch of faith which lights the skies at night. Her strength is her beauty as she smiles at the ships in time of need the length of her dress is as beautiful as time goes on. She stands by herself in your time of faith, the tabloid of knowledge is her book of knowledge, her knowledge being her book of knowledge. Her knowledge is hers to show you your faith in her knowledge and in her faith which is your path to the road of liberty to your home of faith! She gives you her problems so you can help her and others. She solves your problems as she gives you hers so give her a kiss of gratitude as being your torch of life and liberty in happiness. 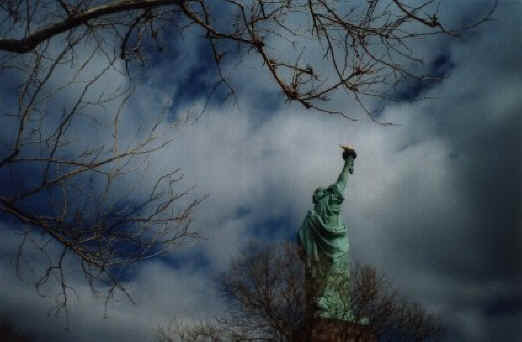 Her crown is yours as she is our Statue of Liberty! You can take a bow as she is our torch of faith. Take pride in her which is for you keep her American stand of dreams come true. Keep her faith as her foundation is yours, to hold on to keep her safe, give her freedom as she gives us her courage to stand for her grace! Keep her beauty shining as she is our lady. Hold her hand as she needs encouragement. Her faith in war or in peace she is always here. She is the faith of America for her faith is your faith for your faith is her face to give you love. The love of freedom is yours to keep as long as the American flag waves for peace and honor in her days of old and days of new!